Starting around the same time as Chapman & Dodd’s more scholarly reprint series the Abbey Classics (1920-1937), the Abbey Library contained both copyright and non-copyright literature and was published only through about 1927. 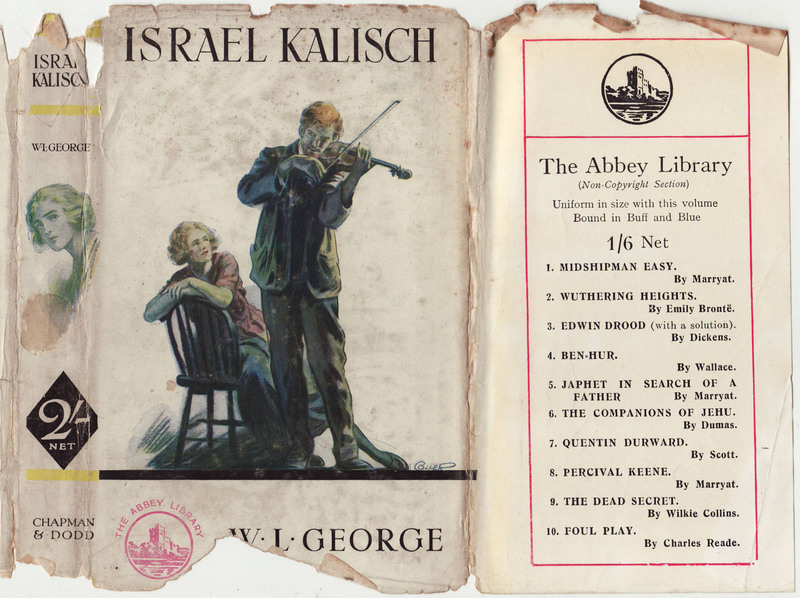 The series “non-copyright section” included many of the same moldy oldies found in other series at the time (Marryat, Brontë, Dickens, Scott, etc.). The “copyright section” included a range of contemporary authors, including Arnold Bennett, Marjorie Bowen, W.L. George, and Barry Pain. The design of the books was rather extravagant, contrasting awkwardly with the extremely cheap paper and binding. Series jackets were illustrated and unique to each title. The spine of the jacket on this copy of W.L. 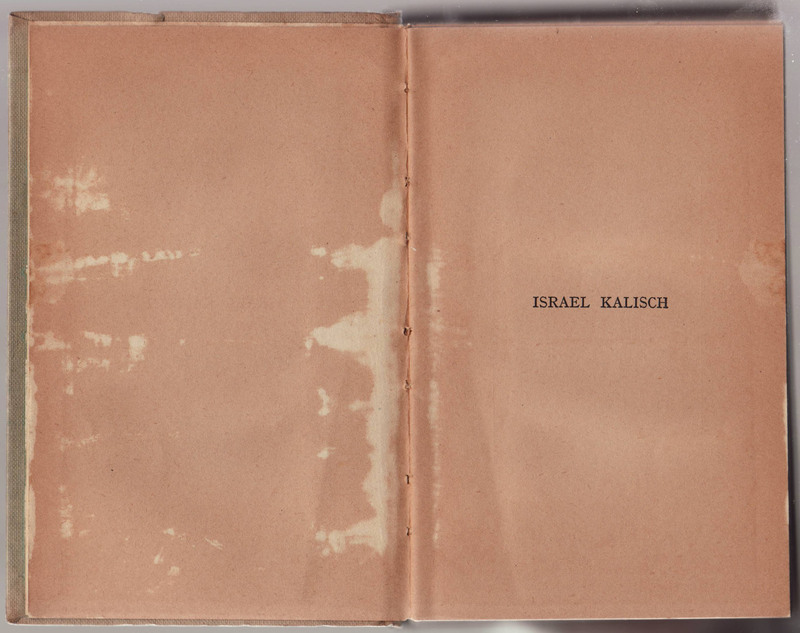 George’s Israel Kalisch contains an illustration along with the price (2/- net), illustrating the importance of the jacket spine in advertising (for books typically sitting on bookseller’s shelves, spine out). The front of the jacket contains the series logo. 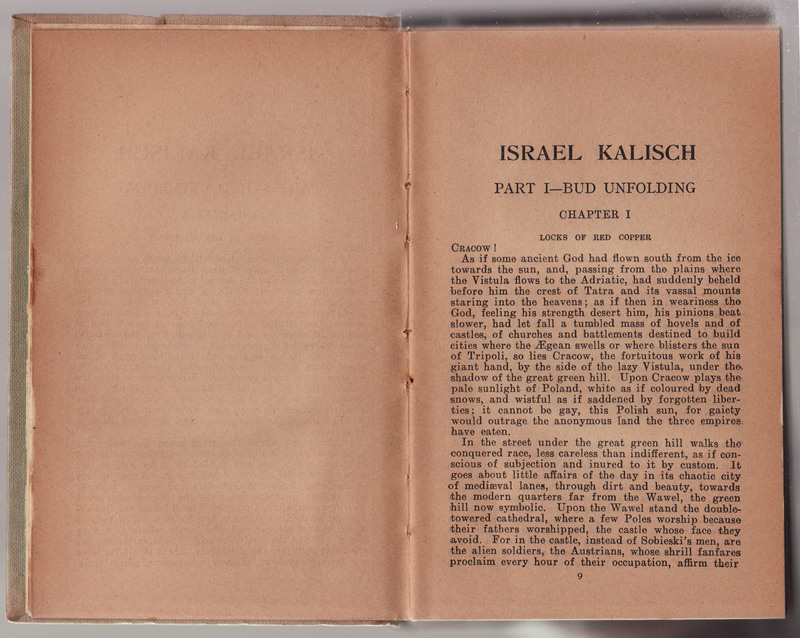 The front flap also contains the series colophon and a list of titles in the “non-copyright section. The price for non-copyright fiction is 1/6, cheaper than the copyright section titles. 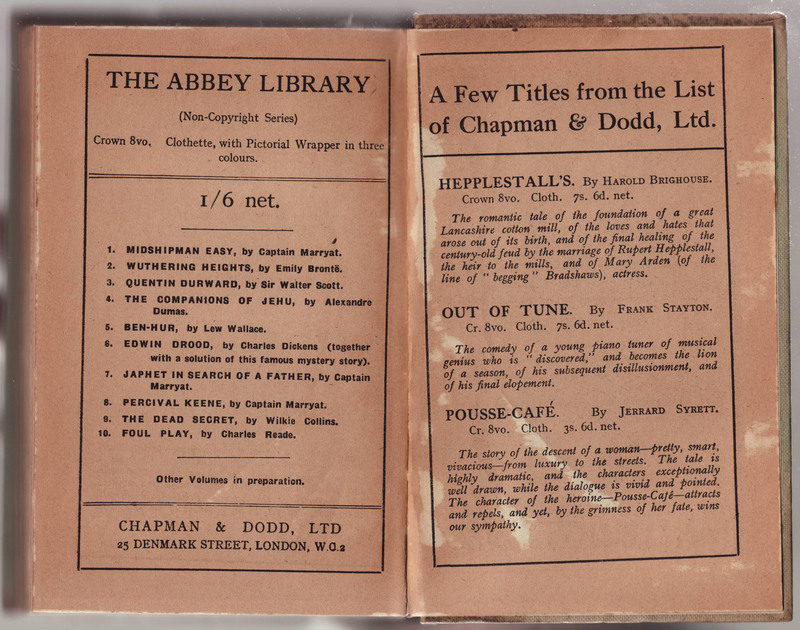 Given Chapman & Hall trade novels advertised in the back of this book, it dates to approximately 1922. The rear jacket flap has a corresponding list of the 2/- copyright section titles. 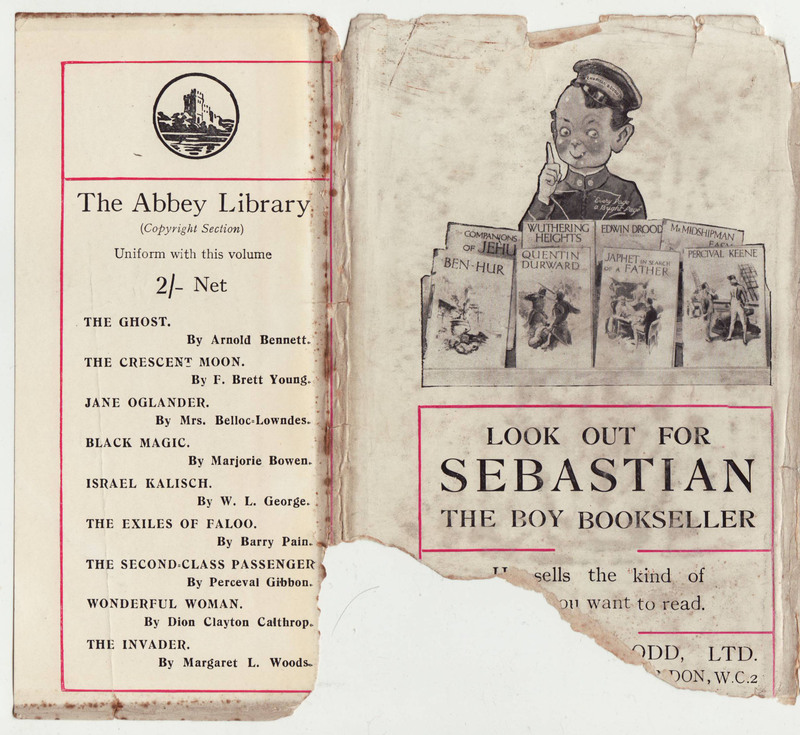 The jacket back contains a promotional character, “Sebastian the Boy Bookseller,” who may have been featured in Chapman & Dodd displays in bookstores. 1. Midshipman Easy, by Marryat. 2. Wuthering Heights, by Emily Bronte. 3. Edwin Drood (With a Solution), by Dickens. 5. Japhet in Search of a Father, by Marryat. 6. The Companions Of Jehu, by Dumas. 7. Quentin Durward, by Scott. 8. Percival Keene, by Marryat. 9. The Dead Secret, by Wilkie Collins. 10. Foul Play, by Charles Reade. The Ghost, by Arnold Bennett. The Crescent Moon, by F. Brett Young. Jane Oglander, by Mrs. Belloc-Lowndes. Black Magic, by Marjorie Bowen. Israel Kalisch, by W.L. George. The Exiles Of Faloo, by Barry Pain. The Second-Class Passenger, By Perceval Gibbon. 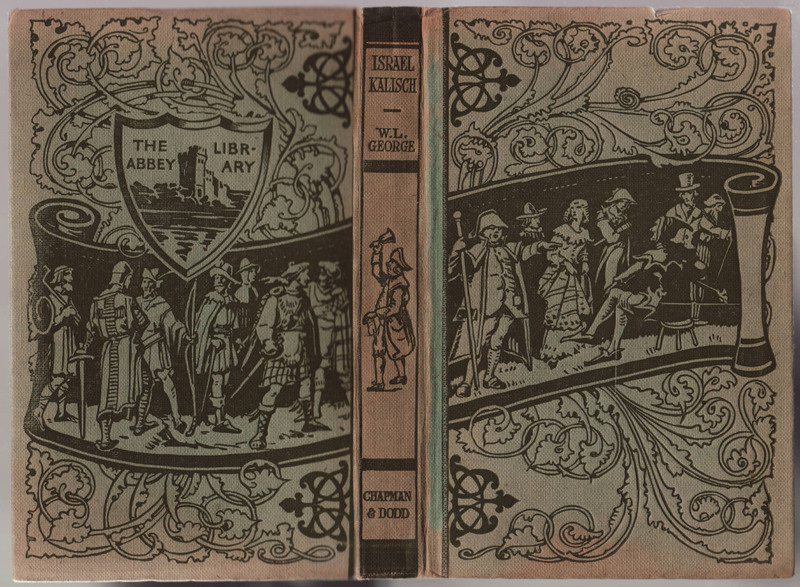 Bindings are a wonder of fulsome design, with curling arts & crafts fronds surrounding the series logo and name (on the back) and a scroll of historical characters (more fitting for the older classics in the Abbey Classics than the more contemporary titles in the Abbey Library). Graphical “hinges” flank the spine which is also illustrated. 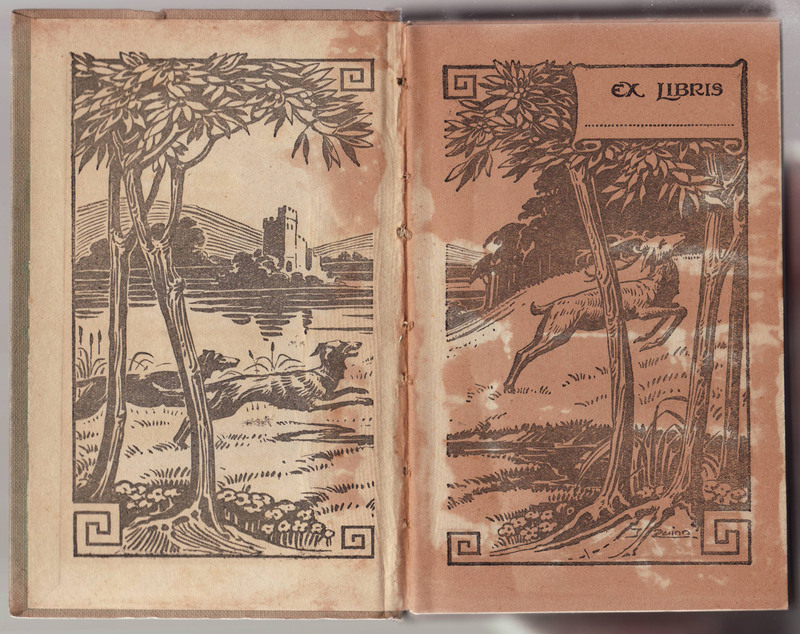 The endpapers carry on with the gregarious design, showing a pair of hounds chasing a stag in a meadow beyond which lies a lake with a picturesque ruin of an abbey. A blank Ex Libris element is included in the drawing to help avoid having to stick an Ex Libris sticker over the endpaper designs. The quality of the paper, here on the half-title page very yellowed and brittle, is poor, and the sewn bindings weak and cracking. A list of titles in the copyright section of the series faces the title page. There is no date or copyright information in the book. 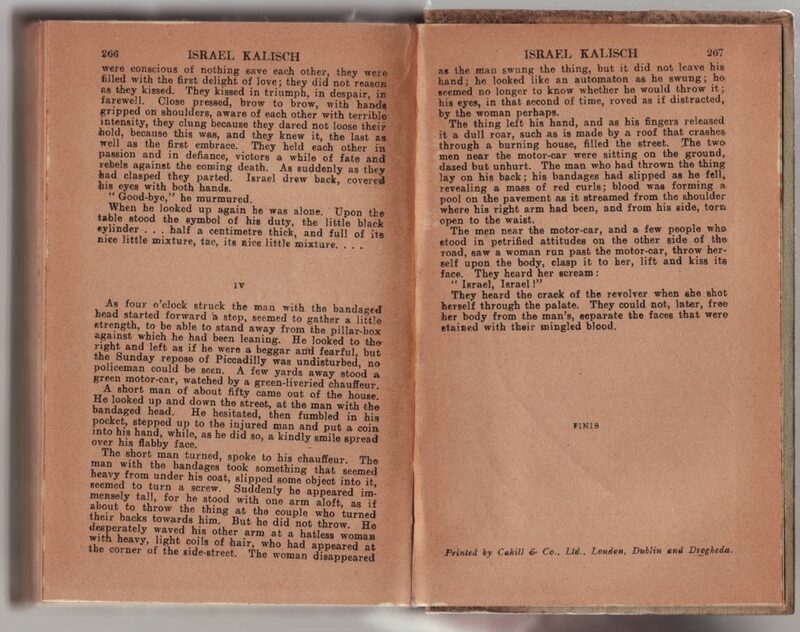 The printer, Cahill & Co. Ltd. of London is indicated on the last page of the novel’s text. A short catalog of titles in the non-copyright section of the Abbey Library faces a list of new trade titles from Chapman & Dodd. 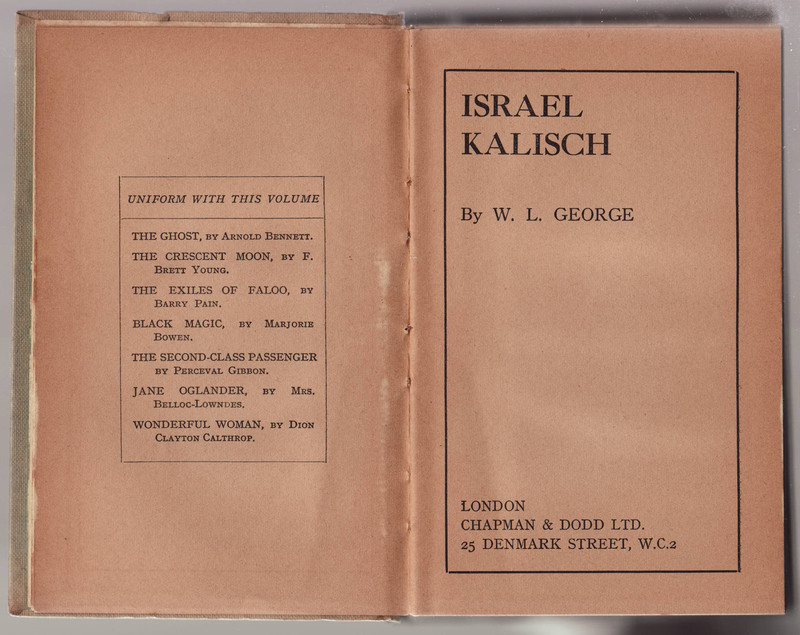 The three titles (Brighouse, Stayton, and Syrett) were all issued in 1922, which dates this book to about that year.